My most accomplished painting to date is a portrait of an old woman, Grandma (2003), while its companion painting, Liberation Road (2010), is my most personal one. This painting was based on a photo of my paternal great great grandmother, or maybe great grandmother, I do not really know for sure. She was a very elegant woman with a knowing look and her photo had often haunted me and caused me to wonder what had happened to her, to her family, to her descendants in the ensuring years – all those endless upheavals, wars, famine – human suffering of all kinds, from the end of the imperial time, the republican era and culminated in the so-called revolution in the mid-twentieth century. 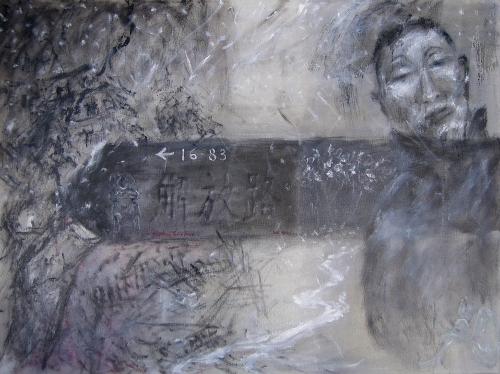 Furthermore, this painting also touched on the traumatic experiences my parents and my sibling and myself suffered in the iron grip of the Chinese Communist Party, or any totalitarian regime, even to this very day. The left side of the painting showed ruined houses and railroads, balancing the right side of the portrait of my dignified grandmother. The horizontal road sign bisecting the painting read “Liberation Road”, yet at the end of the arrow, we saw a sorrow-stricken person, helplessly rested his/her head on the knees, anything but liberated. There was a similar figure, at the lower right of the painting, echoing this figure, in the same posture, though in profile. I made this painting to pay tribute to my elegant ancestors who had striven to achieve personal enlightenment and successes and later suffered precisely for their achievements in the hands of the anti-intellectual and self-righteous puritanical Communist Party. By surrounding my great grandmother with ruins and other suffering people, I tried to demonstrate the scope of the destruction in the wake of the Communist Party. I also made a short video (1:56) to present this rather haunting painting. In order to show both the complete picture and its details as the “camera” panning across the canvas, I incorporated two video clips into one single final video and they can be played simultaneously. I deliberately kept my left clip static, so as to show the complete painting, while the right clip demonstrate the details, exactly as the video above.